This past weekend, through no particular planning or careful orchestration by the scheduling elves (though we always rely heavily on TEWS for advance notice on shows you shouldn’t miss), one great night at the theatre turned into two. And then two turned into three. Three direct hits in a row. Certainly not an impossible feat, but also not something you find just any weekend in PDX (and a lot more fun than the “three strikes, you’re out” experience on the other end of the spectrum). In hindsight, these three shows display everything that is right with the local scene. If you had jetted into town from afar and seen just these gems, you’d go home (rightly) concluding that there is some serious talent on the loose. First up, on Friday night it was Liminal’s soaring production of OUR TOWN at The Headwaters. This on the beaten (train) tracks venue on NE Farragut is no longer on a roll. It’s on whatever comes AFTER the roll stage. 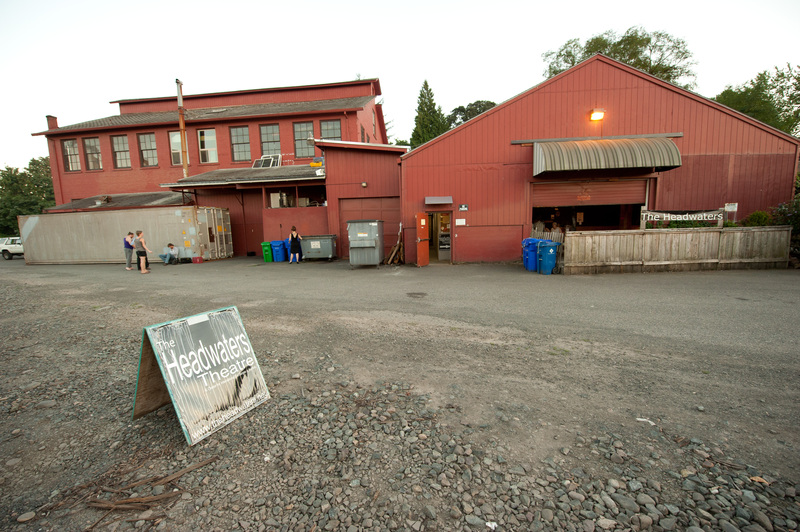 Now firmly established as the city’s leading Off Burnside space, Headwaters seems to be making a habit of hosting one unforgettable production after another. After another. After another. Must be part of the selection criteria. AND, though (as they say in the financial industry) past results are no guarantee of future performance, by now you would be remiss to not get the pattern here and look ahead to the NEXT show at Headwaters, which is AMERICAN ME by Mizu Desierto, the active force behind the place. That’s coming December 6. OUR TOWN. Liminal’s show is a treasure. Without giving too much away, it never starts and it never ends. Get there early and leave late. Technology is creatively used to forward the show. But, unlike in so many other productions where someone evidently got a projector and set of mics for Christmas and can’t wait to use them, here technology is not the show itself. The show is the same unplugged version that hit the stage in 1938 and no doubt curled the hair of more than a few audience members. Before there was STREETCAR or SALESMAN or GODOT – there was OUR TOWN. It’s a pretty stunning achievement and (when done as well as it is here) remains a riveting and moving theatrical experience. And if there is anything more jarring than how good the show is, it’s how cheap it is. If you go on a Wednesday (2 for 1) tickets are $8. Huh? You are never EVER going to find better value than that. An incredible show. Leave an extra $20 in the till so these folks can bring us more good stuff in future. Saturday night it was the studio at PCS for SLINGSHOT. Bad Reputation Productions is another smaller outfit that has been tearing up its own corner of the Portland entertainment world. The idea here is to bring some of the excitement of great local acts like The Aces and The Liberators into the city’s upscale (but all too often moribund) flagship theatre venue in the Pearl. It’s a great idea, with the results you would expect. In Act I Shelley McLendon and Michael Fetters lit the place up with a series of manically paced skits. Fetters can pretty much walk on stage and it’s funny. When he’s dressed up like a Viennese maid in a blonde pig tailed wig hyperventilating about spring (make that SPRING), it’s kinda hard to hear what anyone else is saying. McLendon is also snap crack funny. Act II featured guest performer Bryan Coffee from L.A. doing his intriguing and very creative BRINK OF EXTINCTION piece. At about 75 minutes with no intermission, the whole evening is a perfectly digestible chunk of pure fun. Brilliant. Sunday night is not a common show slot in Portland, but it’s one of my favorites. What better way to decommission another weekend than to keep it going just a little bit longer with one more night out? And in this case it was off to the other side of the tracks on SE Clinton where Action/Adventure’s Palace of Fun (I think the official name is just “theatre”) is generating almost as much noise as the passing freight trains with FALL OF THE BAND. A/A’s star-studded FALL OF THE HOUSE, the original Portland young person’s live soap opera smash a few years back, was not an easy production to follow up, and I initially worried about FOTB’s prospects. A number of former favorites were out of the picture or had moved to New York (a most unfortunate trend that continues), plus there was no more Addison. And, like any audience, we get very used to our show and characters and loathe change of any kind. Wisely, A/A decided to slap us upside the head and do something different. Well if there were any lingering doubts about this latest concept or A/A’s ability to keep cranking out the gold, last night’s show buried them. What really stood out was not just the actors, who can seemingly be hilarious and adorable and arch and all young and plucky on stage at a moment’s notice. It was also the writing and theatricality. Jimmy’s dream sequence, in which he was (as the screen informed us) “tripping ballz” was brilliant. Altogether it was one of the most enjoyable nights of comedy and theatre I’ve seen in a while, and the fact that it’s 100% home grown only adds to the glow. These people are fantastic. That an evening like this could cost you a mere $14 (or $10 if you get the pass) is ridiculous. This is what truly popular theatre looks like, and you don’t want to miss it. So there you have it. 1-2-3. And on this past weekend, three of the city’s smaller companies reminded us just how good it can be.